Richard Brooks globe vase - 9½" (241 mm) high, 9½" (241 mm) diameter. Richard Brooks was born in 1951 in Sydney, Australia. In 1971, after studying in Sydney and gaining certificates in ceramics, he came to England to start a three year apprenticeship with David Leach. On his return to Sydney in 1974 he spent a year as an apprentice to Shiga Shigeo. Following this he gained further experience working for six months at the Royal Doulton Craft Studio in Australia under the directorship of Derek Smith. 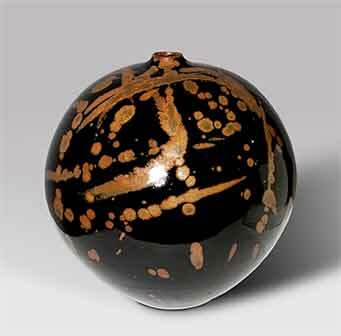 Richard established his first workshop, Booralie Pottery, at Terry Hills, Sydney, in 1976, making high-fired earthenware pots. He took on a number of students over a period of four years before moving to larger premises and changing production to stoneware and porcelain. The use of four body clays and about five glazes gives Richard the ability to produce a wide variety of shapes, sizes, textures and colours. His work shows a thorough understanding of his medium and an unusually well developed sense of form.